The Volvo Ocean Race crew aboard Team Sanya set off from Madagascar on Saturday with their new rig in place to resume racing in the first stage of Leg 2 and are en route to a secret location in the Indian Ocean. A team of six sailors departed Fort Dauphin, motoring to a point two nautical miles east of the island where the team suspended racing on December 20 after damaging a vital piece of rigging, their D2. At 0740 UTC today the team radioed Volvo Ocean Race HQ to report that they had resumed sailing the remaining course of more than 2,000 nautical miles to the loading/unloading port in the Indian Ocean, which is unidentified due to the threat of piracy. Sanya’s helmsman/trimmer Richard Mason, skippering the yacht while Mike Sanderson tends to team management responsibilities in Abu Dhabi, said it felt great to be back at sea thanks to the help of the shore crew. 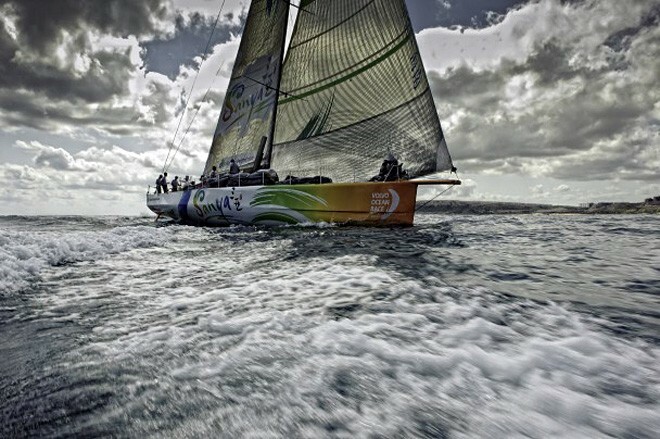 Sanya should arrive at the port in time to hook up with the rest of the fleet for the second stage of Leg 3. Just by reaching the port under racing conditions, they will pick up four points for Leg 2 Stage 1, one point for Leg 2 Stage 2 and two points for the Etihad Airways In-Port Race in Abu Dhabi. Despite missing the first stage, they will also score full points for Leg 3 from Abu Dhabi to their home port of Sanya in Hainan Province. Mason said the team expected to face trying conditions until they reach the waypoint of Mauritius. Race meteorologist Gonzalo Infante said a tropical cyclone in the Mozambique Channel would stir some big winds, but Sanya should avoid the worst of it as they trek north while the cyclone moves east. Fortunately the team were able to test their new rig in similar challenging conditions on Friday, shore crew manager Nick Bice said, with the rig facing a testing 25 to 30 knots of wind. ‘The rig was great, and we did as much as we could with the weather we had,’’ he said. The team are aiming to reach the safe haven in less than two weeks, though sailing shorthanded means, in the words of Mason, ‘we won’t be pushing the boat as aggressively as if we were racing’. Sailing alongside Mason are Ryan Houston, Dave Swete, Bert Schandevyl, Cameron Dunn and Teng Jiang He, better known to his team mates as Tiger. Media Crew Member Andres Soriano will document their race from on board. Mason said despite being struck by damage in the second consecutive leg, the team remained buoyant and confident. ‘They say that trying times define a team and this one keeps getting stronger and stronger,’’ he said.